The bus drivers test their idea by taking their own week away in the bus. En route they encounter a musical group who need replacement transport and then later discover they have a stowaway. The number of people on the bus rises from 4 to 8 and the whole plot just gets more far-fetched, and more tongue-in-cheek, as it progresses. We decided to go with the spirit of the evening and arrived by bus. 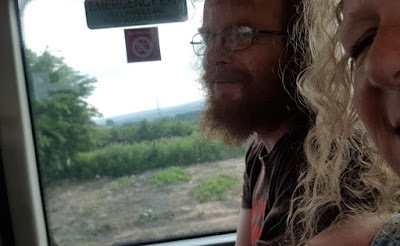 It was a really relaxing start to the night actually, nice to chat on the way without anyone concentrating on the driving, plus it saved us having to find a parking space. 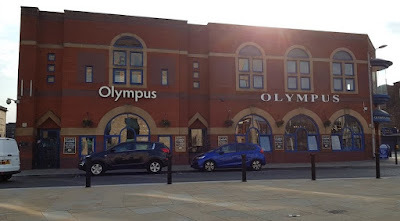 Although the show is suitable for children we had a babysitter, so it was our annual date night a very rare night off and our event started with a press pre-launch at the Olympus Fish And Chip Shop right opposite the Interchange. 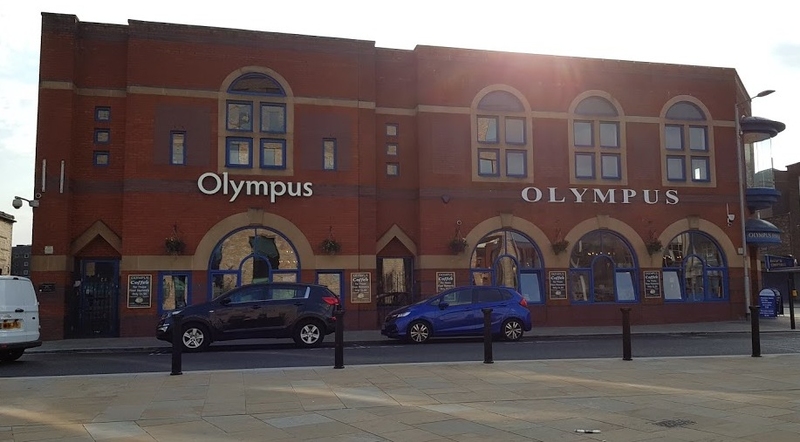 That is the biggest and smartest fish and chip restaurant I've ever been in, and tasty too, so that'll be a regular lunch call when we are in Bolton. 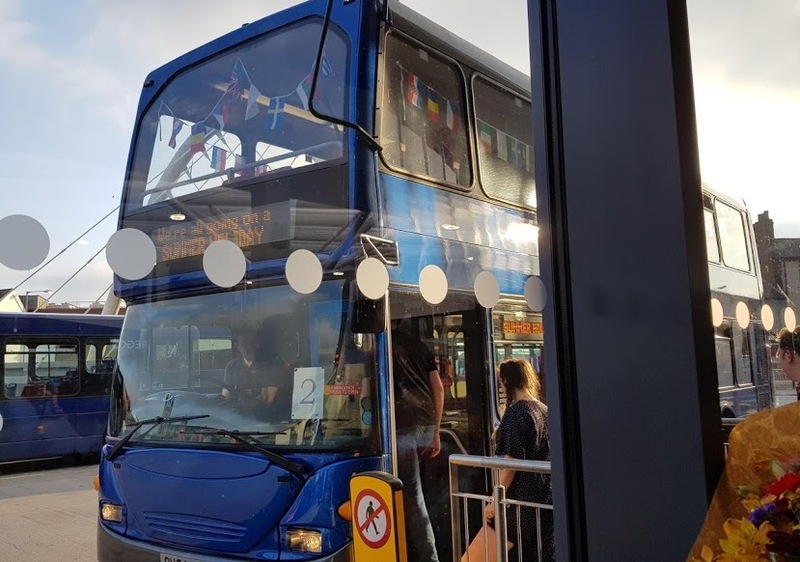 By 7.15pm the audience had begun to arrive at Bolton Interchange, and a large area to one side was roped off. You gather here before the performance, and there are also 2 periods during the evening where you stand for around 12 minutes - bear this in mind if you have limited mobility or trouble standing. A couple of attendees carried a fold up garden chair with them for exactly this reason. Almost bang on 7.30pm the action started, much to the delight of the audience and everyone else who happened to be at the interchange at the time! It's almost a flash mob and the grins all around the room were amazing. 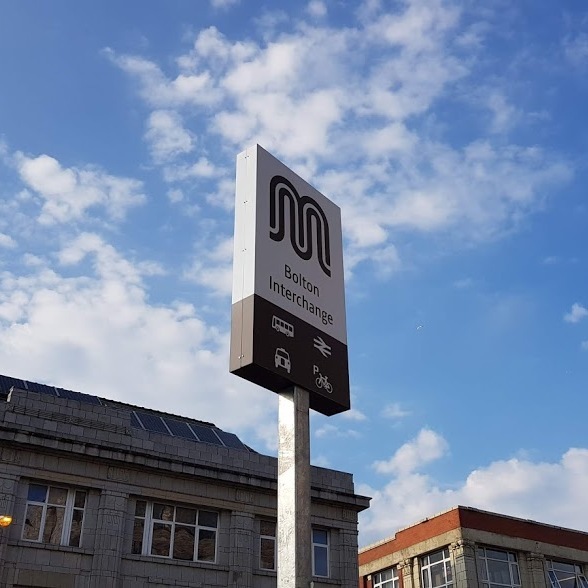 If you know the Cliff Richard movie then you'll know how the story starts, and that the bus station is the perfect location. By 7.45pm we were all boarding 6 genuine decorated busses, off to France on holiday! We had cast member Alexander Bean, who plays Cyril, on our bus and he was hilarious. His enthusiasm was contagious and we all sang our way on our epic journey around the block to Victoria Square and Bolton Town Hall. The 6 busses in a crescent were very impressive, and everyone got out to stand beside their bus and watch the next part of the performance. The sound was almost perfect, everyone could hear and follow the action. 200 yards away is the Octagon Theatre, and the cast stayed in role and chatted away to the audience as we made our way around and showed our tickets for entry. Despite the fact we had all come from a different location only moments before, it worked incredibly well and we were all in our seats in under 10 minutes. The rest of the play was more traditional, but only just. Scenery swept past on stage to depict travel, and the multi-talented cast of 10 sang and danced their way through the storyline. I'm pretty sure between them they played 11 different instruments, and Barbara's (Eleanor Brown) solo singing was brilliant. The amount of costume changes in the last section was insane, goodness knows how they managed that, and all so perfectly 60's too. Highlight though was the comedy. Ad lib or rehearsed, it didn't matter, but there were plenty of belly laughs. Stella (Barbara Hockaday) as a Flamenco dancer will stay with me for a long time, and for all the right reasons. Don (Michael Peavoy) taking his shower won a wolf whistle from the audience that even made him laugh. Everyone seemed to be having an excellent time and the audience were carried away. It was of course all a vehicle for Cliff Richard and The Shadows, and there was lots of formation dancing while strumming, as the whole audience sang along, some even getting out of their seats to dance. You can't fault it. If anything went wrong, we missed it because so much went right. It may not be entirely as much fun in the rain, although a brolly would see you right, and you'll want a thin jacket with you anyway. It's well worth it to see the cast dance on the Town Hall Steps and grin at your bus driver who can't quite believe what he's doing! The cast references to the 'Bolt-on bus' in their US accents were not only hilarious, but very appropriate. 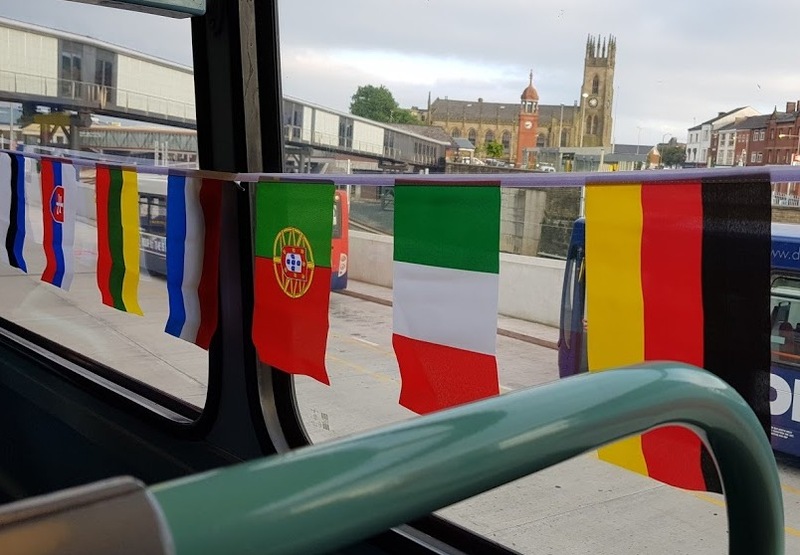 This couldn't take place without the support of Transport for Greater Manchester and the Bolton Vision Bus Company, so it was only correct that when it finished at 10.15pm, we went back to the Interchange and caught our last one home. 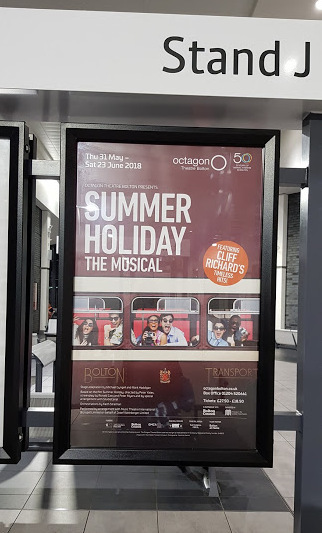 The Octagon Theatre, Bolton's production of Summer Holiday is running until 23rd June. 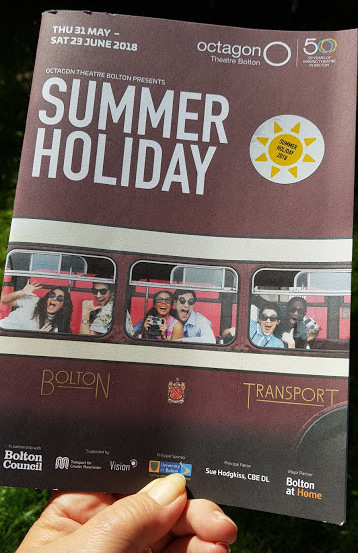 Tickets cost £27.50-£18.50 per person and are available now from the Octagon Theatre Bolton website, where you can also find out more about Summer Holiday and it's cast and crew, and what's happening later in the year. We attended free of charge to review.